Bistek is actually a Filipino version of beef steak marinated and cooked with soy sauce and is not the grilled steak which is popular in western cooking. The bistek version I have here used tanigue or Spanish mackerel fish steaks as a substitute to beef. So the next time you are in the market and saw tanigue steaks and don’t know how to cook it, this recipe might be worth a try. 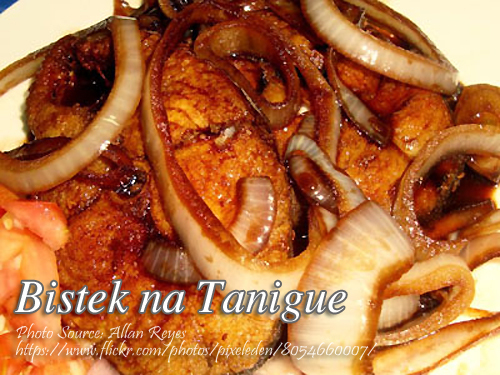 To cook bistek na tanigue: Rub tanigue steaks with salt and fry until golden brown. Transfer to a plate or container and set aside. Heat a tablespoon of cooking oil in a pan and saute garlic and onion. Then add the soy sauce and kalamansi juice. Mix with sugar until the sauce becomes balanced with sweet, sour and salty taste. Adjust the soy sauce, sugar and kalamansi until you got the desired result. Let it simmer for a few seconds then add the fried tanigue steaks. Simmer at least 2 minutes and then serve hot. Bistek is actually a Filipino version of beef steak marinated and cooked with soy sauce and is not the grilled steak which is popular in western cooking. Rub tanigue steaks with salt and fry until golden brown. Transfer to a plate or container and set aside. Heat a tablespoon of cooking oil in a pan and saute garlic and onion. Then add the soy sauce and kalamansi juice. Mix with sugar until the sauce becomes balanced with sweet, sour and salty taste. Adjust the soy sauce, sugar and kalamansi until you got the desired result. Let it simmer for a few seconds then add the fried tanigue steaks. Simmer at least 2 minutes and then serve hot. I’m glad I found your bistek na tanigue recipe! I plan to cook it tonight. Thanks! Hi Theresa, I’m also glad you found this recipe! Cheers! Can I cook this without frying the fish? Hi Delza, you can cook it without frying the fish but it will taste fishy and will crumble to pieces when you cook it with the sauce.